As you would expect from a new action series developed by FromSoftware, Sekiro: Shadows Die Twice is pretty tough. However, the challenge won’t stop players from trying to get 1000 Gamerscore or the platinum trophy. So that you can prepare for that, here’s everything you need to know about if there is a difficulty trophy or achievement in Sekiro. There’s actually no difficulty trophy or achievement in Sekiro, and that’s down to there being no difficulty options of any kind in the game. Without having the ability to change difficulty from the default, it’s not possible for there to be a trophy or achievement that rests on you completing the game on a harder difficulty level. If you find the challenge that Sekiro presents and you’re looking to get all the achievements or trophies, then you’ll probably be pleased to know that there isn’t a difficulty trophy or achievement. That being said, Sekiro’s one and only difficulty mode is basically a hard mode anyway. Even if you’ve got a lot of experience with the likes of Dark Souls and Bloodborne, you’re going to find it hard going here due to the sheer pace of the action and how you need to approach encounters in very different ways. 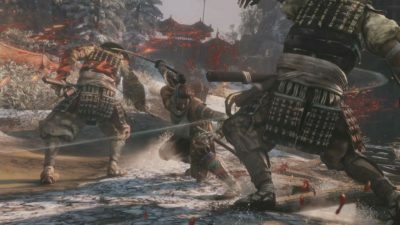 Away from any potential difficulty trophy or achievement, the lists in Sekiro relate to beating the various bosses and unique enemies in the game, with there being others for upgrading skills, prosthetic tools fully, and completing other story based events. Those are the kind of things you’ll have to think about as you progress. That’s everything you need to know about if there is a difficulty trophy or achievement in Sekiro. For more tips and tricks on the game, be sure to check out our Sekiro wiki guide or search for Twinfinite.